View cart “Andy Warhol fuer die Gruenen” has been added to your cart. 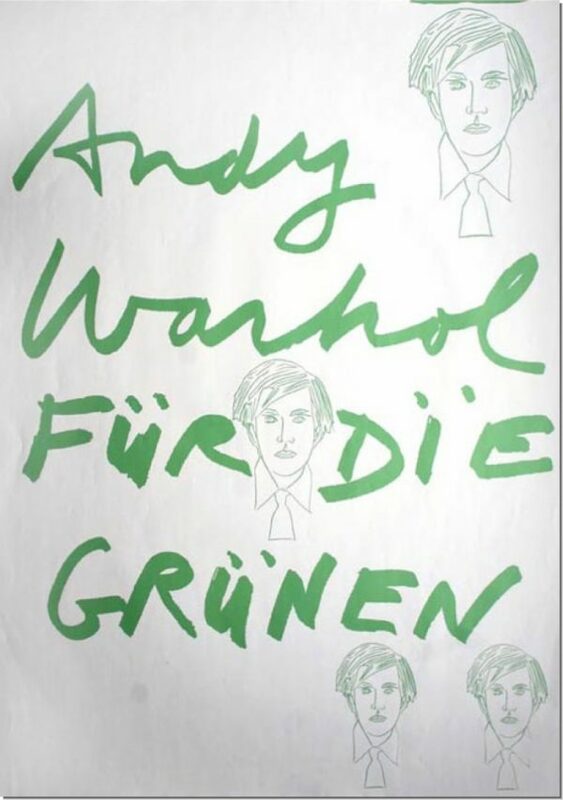 Warhol intended the portraits to be used for the Green Party’s parliamentary campaign in 1980 (Beuys was one of the founding members of the party and was active in the last decade of his life). However, the image of Beuys’ face would have suggested that his involvement with the Greens was a political performance as opposed to a real political movement. Instead, Warhol designed a new poster with several self-portraits that was distributed locally around Düsseldorf by means of a VW van driving around the city and tented area where Beuys again spoke to passers-by. [⁠4] Despite the U.S. artist’s notoriety, his poster was not widely used. However, I consider this to be their greatest artistic collaboration. Warhol admired Beuys’ political projects (which are the subject of my dissertation), even if he didn’t completely understand the German artist’s goals. As Daniel Spaulding argued in his paper at the 2016 College Art Association conference, Warhol and Beuys present two parts of a dialectic: Warhol used technical reproductions to translate consumer seduction into a demand for art, while Beuys’ secular magic and shamanism stood for a lost modernist utopia.⁠ Beuys’ admired Warhol because of he thought the U.S. artist’s work was a political statement about U.S. society, though in his own work he tried to enact a revolutionary transformation.